I have to say that I am glad my wife does not go nuts for Valentines Day. She does not expect expensive gifts or really any gifts at all, and she does not get upset when I am not romantic for the "holiday". I hear horror stories from other guys and I am just happy to not have to deal with that BS. It seems that some guys are just destined to fail the high expectations that their wives place on them. 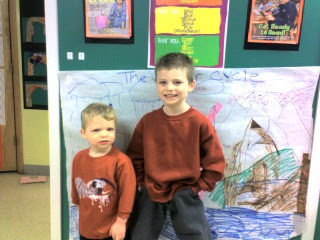 Tyler and Connor were excited for the day. Candy is always popular with them and the whole giving / getting cards to / from all the kids in the class is exciting. I guess I will find out tonight if it was all as wonderful as they seemed to think it was going to be. I guess since they are so young I will not question their masculinity based on being excited for the day. But real men think Valentines day is stupid. It is, you know. It is really a stupid holiday. But I hope everyone out there has a nice one. I ran into a problem where my personal computer seemed to be triggering a 3-password failure lockout on a client's domain. I was locked out probably 20 times in a 3 - day period. Honestly, I am not that idiotic to type in a password incorrectly 60 times! It took me awhile to track it down to my personal laptop, but eventually I shut it down for awhile and had no problems. Almost as soon as I started it back up, I was getting locked out. I had cleared out all mapped drives and all of the Client's printers from my computer. The issue occurred even though I was not trying to log onto any of the domain server. It appeared that all I had to do was start Internet Explorer. It is sort of weird, because I have been at the client for a long time and never had this problem (at least to this extent). I also had not changed my password on the domain for several weeks. So, after seeming to track it down to IE, I decided to try to clear out my NTML passwords. Unfortunately, how to do this is not very well documented and it was sort of hard to find even on the Internet. A bunch of people gave really stupid ways to trick IE into acting like and individual password was cleared out, but certainly not how to just blow them all away. I deleted the folders in the Credential folder. I do not know how the whole challenge / response works for IE's NTML Auto-Autentication, but it appears that my encrypted file must have been corrupted in such a way that IE was trying to logon to the Domain at least times with an incorrect password before passing the prompt back to me. Deleting the text file seems to have fixed my problem. At least I hope so. I thought I had it nailed several times over the past few days. So, if you are ever having a similar problem, be my guest to try this same method. I think it is about time I figured out what I want to be when I grow up. I turned 38 on the 4th of this month. Shouldn't I have some sort of idea what I want to do with my life? Maybe something in computers would be good. I do not know, I hear computer jobs are moving to India and China. I do hear that this internet thing might become big. I should learn to leverage a web presence. Sometimes I feel I am on the verge of figuring it all out. Often I think I am not even close. I need to come up with something so innovative and lucrative that I do not have to earn money from a career. That opens up tons of career choices because you can get all kinds of jobs if you are willing (and able) to work for nothing. I had a nice birthday. For breakfast, my wife and kids put a candle in a stack of pancakes and sang happy birthday to me. The guys that I work with bought me lunch. I got gifts and taken out to the Outback Steakhouse for dinner. I even got cake and ice cream. The gifts I got were nice. My wife got me a beer of the month membership. I hope I can keep up. Apparently she decided to pay month to month so if my beer stock gets too high we can take a month or two off. I do not forsee that being a problem. The only bad thing about it is that an adult must be present to accept the shipments. There is no way to know exactly when one will arrive, and the shipping company is sort of a long way off in the event that we are unable to be at home for a delivery. Anyway it will be interesting to see how much of a pain this ends up being. So, what am I going to be when I grow up? When will I actually grow up? At the moment, when people ask me what I do for a living, I tell them I am a "Computer Geek". That is pretty much what I am, but I do not think I am a very good computer geek. I am not really a specialist at anything. I am also not really a good generalist. Quite often (most of the time) when people ask me a computer question, my answer is that I do not really know. Do not for instance ask me what kind of computer to get. I do not know. Basically, I try to get the one with the best specs for the least amount of money. I cannot build a computer. I cannot hack into the Pentagone. Lots of times when I speak to real computer geeks most of what they say goes right over my head. The fact that I have a job at all has more to do with a series of lucky events (due to my semi-charmed-kind-of-life than any kind of tallent I have. I am actually kind of a lazy idiot. It is interesting because no one seems to think that except me, unless an aweful lot of people have been lying to me my whole career. Whenever I have had to rate myself for job reviews I ALWAYS rate myself very low compared to my managers. Of course, for the past two years I have been my own boss, so it has been awhile since I have gone through that sort of process. I still talk to peers and clients and think my perception of my abilities and worth is much lower than those people. So, here I am, a 38 year old, self-employed computer geek who does not think he is a very good computer geek. I enjoy being a computer geek for the most part, but I just do not think I am great at it. And I am not the kind of person who is out there killing myself to become great at it. I am not pationate enough about work in general to strive to be the very best. So, I am not even close. Actually, I guess technically, I am the employee (the only employee) of an S-Corporation. One of the guys in the same situation I am in says that is not the same as being self-employeed. I am not sure I agree with him, although, I do see his point. I will still call myself self-employeed, though. A guy just told me that by 2015 there will be the biggest demand in history of technical resourses here in the US. That means I will have all kinds of opportunity whether or not a bulk of the developer jobs are overseas. I just have to maintain my mediocre status, and stay up somewhat and I am golden with the job I have now. So, in the meantime, I still have time to figure out what I want to be when I grow up. If I pass my 65th birthday and still do not know, maybe I'll start to panic. The Nathan Yip Foundation provides schools, education, medical, and financial support to underprivileged children in 3rd world countries. It was founded in 2002 by Jimmy and Linda Yip after they lost their 19 year old son, Nathan, in an automobile accident. Nathan had a passion for philanthropic activities and became overwhelmed by the poverty and lack of educational opportunities for children world-wide. While alive Nathan spoke of starting a foundation with his father to help impoverished children worldwide. After Nathan's death Jimmy and Linda started the foundation with the hope that the Nathan Yip Foundation will build upon Nathan's legacy and bring positive energy from their tragic loss. In just over 5 years, the Nathan Yip Foundation has raised over $500,000 and are funding projects in China, Mexico, and Africa. Check out http://www.nathanyipfoundation.com/donate/makeadifference.html on how to help make a difference through the Nathan Yip Foundation. 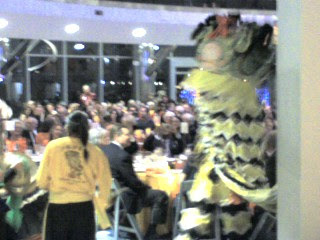 On Saturday, February 2, 2008, the Foundation sponsored an event at the Cable Center at the University of Denver for the "International Celebration for the Chinese New Year." The event included a silent and live auctions and included special performances from Metropolitian Opera Star, Hao Jiang Tian and the Shaolin Hung Mei Dancers. We (Auction Automations) did the silent auction. I thought it was a pretty cool event. I was working so was not really taking it in that much. I was stuck in a corner behind tables of computers. The dancers were very entertaining. The drummers that went along with them were LOUD. Here are a couple of pictures I took of the Dragons from my cell phone. I apologize that they are not very good pictures. 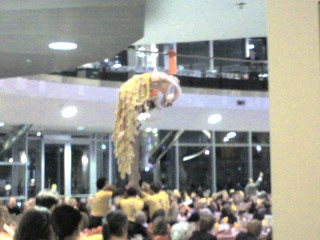 The one on the tois a dragon at the top of a pretty big pole held up by half a dozen or so of the dancers. It was pretty cool. Again, I am sorry the photos did not turn out that great. The silent auction ended up doing very well. It did particularly well during dinner. People really got into the wireless bidding at their tables. Unfortunately, we had a bunch of units that lost their battery power, but we keep up pretty well with the demand. Always leave them wanting more anyway. I really admire Jimmy and Linda. To be able to take the loss of a child and use it as motivation to start something that makes such a difference in the world is really a great accomplishment. I do not even know where I would start had I been in their shoes. I am sure they had great help from friends and family, but I am also sure that they accomplished something that 99% of people in the world would not be able to do. Most people would not even have the heart to want to do something like this, let alone find a way to get it done. Anyway, the Nathan Yip Foundation put on a good show and if you get a chance to attend one of their events in the future, I do recommend it.